The Nassar family had its fruit trees in the West Bank uprooted by the army last month despite a pending legal appeal, which the army now says wasn’t done properly. Daher Nassar keeps farmer’s hours, rising early to tend his fruit trees. But on one recent morning, one of the villagers overlooking his orchard called him extra early and woke him. His trees, which he says numbered about 1,500, had been bulldozed and removed by the Israel Defense Forces before the sun rose over the West Bank hilltops. The uprooting happened on May 19. A few weeks prior, the IDF’s Civil Administration left a notice under a large rock near the trees, saying that it was state land that must be evacuated. In response, on May 12, the Nassar family filed an appeal through their lawyer, stating that they could prove that the trees were planted on family land. Although no verdict was given and only a week had passed, the trees were uprooted and removed anyway, the land bulldozed. CAMERA, which focuses on criticizing the media’s coverage of Israel, quoted Israel’s Ministry of Foreign Affairs in defense of the May 19 uprooting of the trees, saying that no appeal on behalf of the Nassar family had ever been filed. This week, however, ministry spokesman Yigal Palmor told Haaretz that that information was incorrect, following evidence that such an appeal had in fact been made. “It now seems that the information was partly erroneous, and that an appeal was actually filed by Nassar on May 2014, as he claims. We’re waiting for clarifications from COGAT,” Palmor said in an e-mail response, referring to the Coordinator of Government Activities in the Territories, a branch of the IDF. In the latest development, however, the IDF says that the appeal was not done in the proper way, and therefore, it was never discussed in court. The Civil Administration, the branch of part of the IDF that carries out demolitions in the West Bank, thus was not told there was any reason to halt their order to uproot the trees, says Maj. Guy Inbar, the COGAT spokesman. “We just yesterday talked with the [Ofer Military] court, and the court told me that Mr. Nassar’s appeal was not discussed because it was not made as it should be,” Inbar told Haaretz Tuesday. “First, there’s a tax that you need to pay to make an appeal, and they did not pay that tax. Second, Mr. Nassar’s lawyer gave this appeal without showing that he has power of attorney, and that is necessary to start the appeals process,” said Inbar, referring to Daher Nassar’s younger brother, Daoud, who is the family’s main spokesman but was away in the United States when the trees were uprooted. “After a court decision that Mr. Nassar has not shown any ownership of the land, on land that the state says is state land, and after Mr. Nassar was given the opportunity to remove those trees himself, after all of that, we enforced the law and removed those trees,” Inbar said. Reporters in the Middle East are accustomed to the extreme sport of trying to figure out whose version of the story is closer to the truth, and this one is no exception. While the Nassar family says they had 1,500 trees planted in the valley, Inbar says there were only 300 and that there are aerial photographs to prove it. The Nassars say the trees were there for 10 or more years; Inbar says there was nothing there until 2007. Moreover, Inbar says that the trees seem to be an attempt to blur the issues. The Tent of Nations, which is located up the hill about a kilometer away, is also a subject of ongoing dispute with the state. Inbar said it is considered an “illegal post,” with some of it on private Palestinian land and some of it on state land. The dispute is awaiting a decision by the High Court of Justice, he said. The Nassar siblings say they clearly hold the deeds to the land that their grandfather bought in 1916. They’ve been in the area for generations; their families once dwelled primarily in caves. 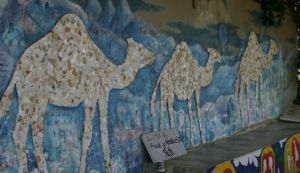 Their father, Bishara Daher Nassar, had a dream of turning the hilltop into a place for peacemaking, and even had a motto: “We refuse to be enemies.” In 2000, several of his nine children established the Tent of Nations, an educational and environmental farm. It’s become a place to welcome peace-oriented groups — including Jewish groups — and host summer camps for Palestinian kids. One of those groups is Encounter, which brings Jews — mostly Americans but also Israelis — to the West Bank to meet Palestinians, particularly those dedicated to nonviolence. In their trips to meet Palestinians with an eye toward better understanding the conflict, Encounter often stops at the Tent of Nations on their way to or from Bethlehem. “I met the Nassar family in 2008. They were immediately warm and welcoming of us bringing groups, including Jewish Americans and Jewish Israelis. Their whole mission is to bring groups of people together to increase understanding of what’s happening to Palestinians,” explains Ilana Sumka, the former Jerusalem director of Encounter and now a volunteer consultant to the group living in Belgium. “It’s in Area C, and that means that it’s a rare place that’s accessible for people with Israeli citizenship to meet Palestinians,” added Sumka, who recently organized a conference call with the Nassar family and 30 Encounter alumni — many of them rabbis and lay leaders in the American Jewish community. 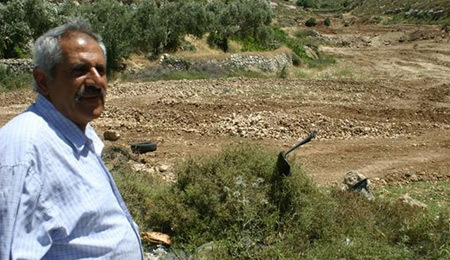 Independent of Encounter, Sumka is organizing a delegation of Jews to come to the site to do a tree-replanting mission. It is planned for next February, the planting season. “I want to let the Nassar family know that the Israeli government’s bulldozers don’t represent my Jewish values,” she explained. Daoud Nassar said in a phone interview yesterday that he was surprised to hear that the IDF now argues that the appeal against the tree uprooting was somehow not legitimate.